Punta Gorda, FL...This past Saturday night, saw the first running of the Florida Sportsman 75 lap race at the Charlotte County Motorsports Park. 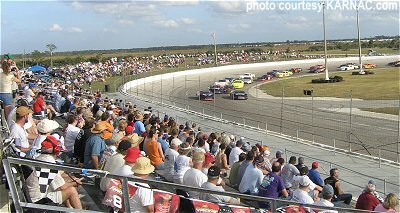 Sportsman drivers from all over the state of Florida were at the 3/8th mile oval and some never even laid eyes on the track until they arrived Saturday. Steve Gainey set fast time in qualifying, with a whooping time of 15.961, almost a half second quicker than the rest of the the field. The first feature event of the evening was the twenty five lap Fab 4 race with Kevin Brooks leading the field to the start. Kyle Rice immediately took his car to the front as the green flag dropped and had a good lead going until the first caution waved on lap nine for debris. On the restart, Rice continued were he had left off and pulled away from the field. On lap seventeen Jarrett Reynolds and Tammy Phillips were battling for position when the two got together in turn one and both spun. Kyle Rice went on to take his first win in the Fab 4's with Tony Shore in second and Jarrett Reynolds finished in the third position. Junior's Trim Shop Road Warriors ran the best they had ran in several weeks with only one caution through out the race. Jerry Tetting sat on the pole for the twenty five lap feature. Blaine Baer took the early lead and led the first five laps, before current points leader Jeff Firestine over took Baer for the spot. Lap ten saw the only caution when Jon Prescott got loose coming out of turn two, slid across the backstretch and spun his car into the infield. On the restart Firestine held the lead and left the battle for the second postion and on back. Jeff Firestine clinched another win with Chris Scott in second and Randy Kile finishing in third. Ander Jackson was the pole sitter for the, 1st annual, Florida Sportsman 75 lap feature event. Fast qualifier, Steve Gainey sat on the outside of the front row. Ander Jackson took the top spot when the green flag waved with Gainey hot on his heels. Jackson would only lead until lap three when Gainey passed Jackson for the lead. Once out front Gainey, walked away from the rest of the pack. The first caution came out for Rick Haugh on lap nine after it was reported that his car was leaking some kind of liquid out of his car. On the restart Gainey again left the rest in his dust and left the battle between Ander Jackson and Aaron Williamson for the second position. Jackson and Williamson battled for several of laps before Aaron Williamson finally got around Ander Jackson on lap forty six and set his eyes for Gainey. The next caution came out on lap forty nine after it was determined that Gary McFall was leaking oil all over the track. McFall was sent to the pits and was able to back to the racing action before the restart of the race to only start leaking fluid again ten laps later. This time the leak was to significant for him to return to the action. The final caution came out with five laps remaining when Timmy Lowe and Greg Krom got tangled up together in turn four. With two laps remaining, second place runner, Aaron Williamson fell off the pace and nearly the entire field was able to get around Williamson. Steve Gainey crossed the start/finish line first, followed by Aaron Williamson second and Greg Krom third. However, in tech Steve Gainey was disqualified for having the wrong valve springs, which handed the win over to Ander Jackson. Greg Krom was awarded second and 2009 Sportsman points champion, Timmie Lowe finished in third. The Pro 4's ran a thirty five lap feature with David Doty sitting in on pole. After the start, Rob Boos and Shane Moore got together in turn four and both were able to keep going with out drawing the caution. David Doty led the first eight laps, before Derrick Horton stuck his car out front. By lap nine, John Pummel Jr, who had made his way from the rear of field was side by side for the first position. The two would battle for several of laps before Pummel was able to make the pass complete on lap twenty and over take the lead. The race ran caution free and John Pummel Jr took home another first place trophy with Derrick Horton and Mike LeMaster completing the top three spots. The final race of the evening was the thirty lap Mini Stocks with Kenneth Badali pacing the field to the start of the race. On the start, Joshua Carbone went spinning on the backstretch and brought out the caution which resulted in a complete restart. On the restart it was Robert Carter who jumped to the early lead and led until lap eight. At that time Jesse Dutilly took over the position with Shane Yoder on his back bumper. Debris brought out the only race caution on lap nineteen and allowed for the field to gather back up. However, no one was able to get around Jesse Dutilly and he sealed another win and claimed the 2009 Mini Stock Championship. Shane Yoder finished in second with Ashlee Williamson in third. East of I-75 at exit 28 on SR 768; then North on Piper Road near the airport.